It has almost been a year since I met up with Kim and the last time we did, we were at my house baking a Japanese cheesecake (which I have yet to master haha). This time, I went to her beautiful house with her cute little malteses (world’s most well behaved dogs) and cooked. It was quite funny because we were trying to figure out how to wrap the chicken and her mother so desperately wanted to help us but we refused her help no matter what. 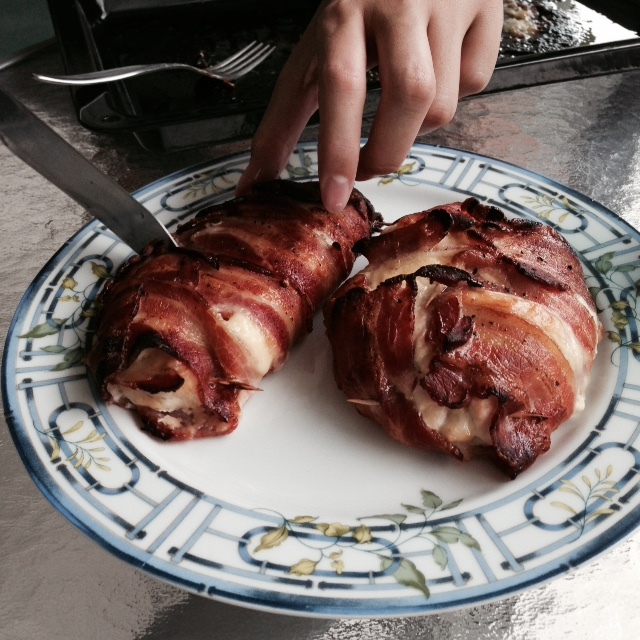 Eventually, we managed to roll it out nicely such that there was nice oozing cheese in the middle and crispy bacon on the outside. The onion rings were a side dish that took forever to make because it was so tedious dipping each ring into flour then batter then breadcrumbs. The onions could have been more well-seasoned perhaps with stronger flavours like smoked paprika because tried spamming with Italian herbs but it was quite mild. 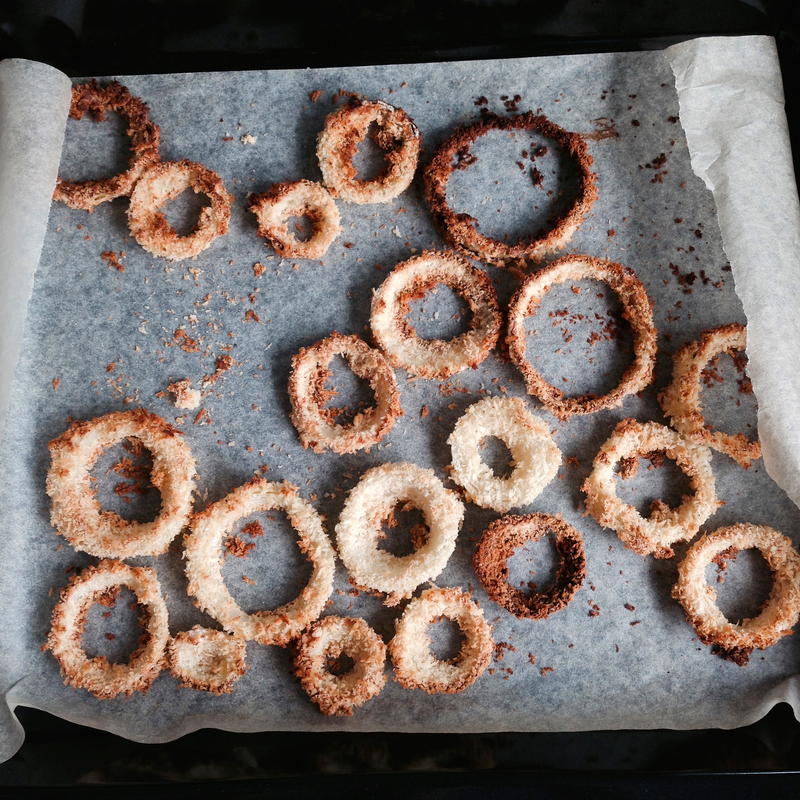 The plus point of this recipe is that you get crispy onion rings without needing to fry it! That is so healthy, considering how much bacon you would have used for the chicken TEEHEE. 1. Cut the chicken breast meat into half the thickness but not all the way through so that you can open the meat up. 2. 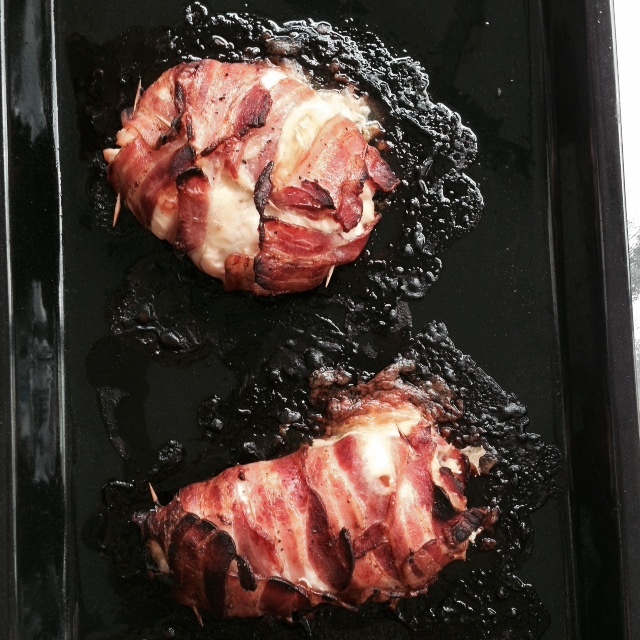 Place the bacon in a longitudinal direction on a baking tray. 3. Place the chicken breast in the same direction. 4. Place the cheese on the chicken breast. 5. 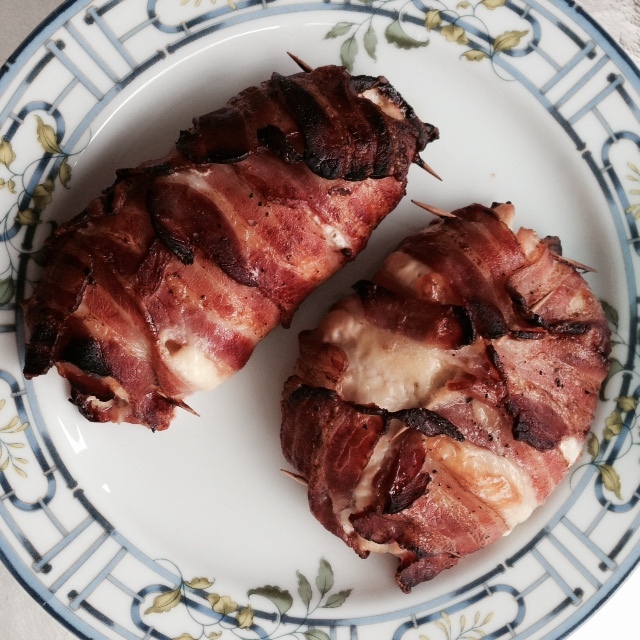 Roll the chicken over the cheese, from the sides to the middle. 6. 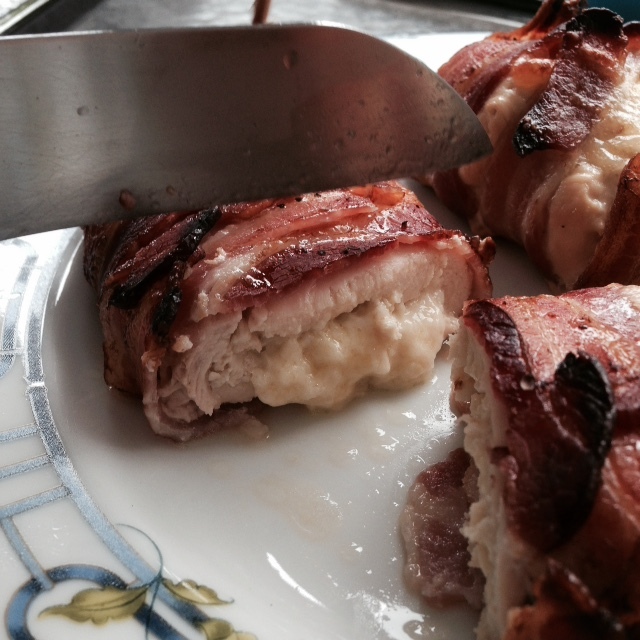 Do the same to the bacon such that all the chicken is covered by the bacon. 7. Place the chicken into a preheated oven of 200 degrees Celsius and bake for 45 minutes. 2. Mix the dusting ingredients in one bowl. 3. Mix the the batter ingredients together with a whisk, it should be the consistency of thick cream, and put in another bowl. 4. Spread the crumb out on a plate. 5. Line baking tray with baking paper. 6. 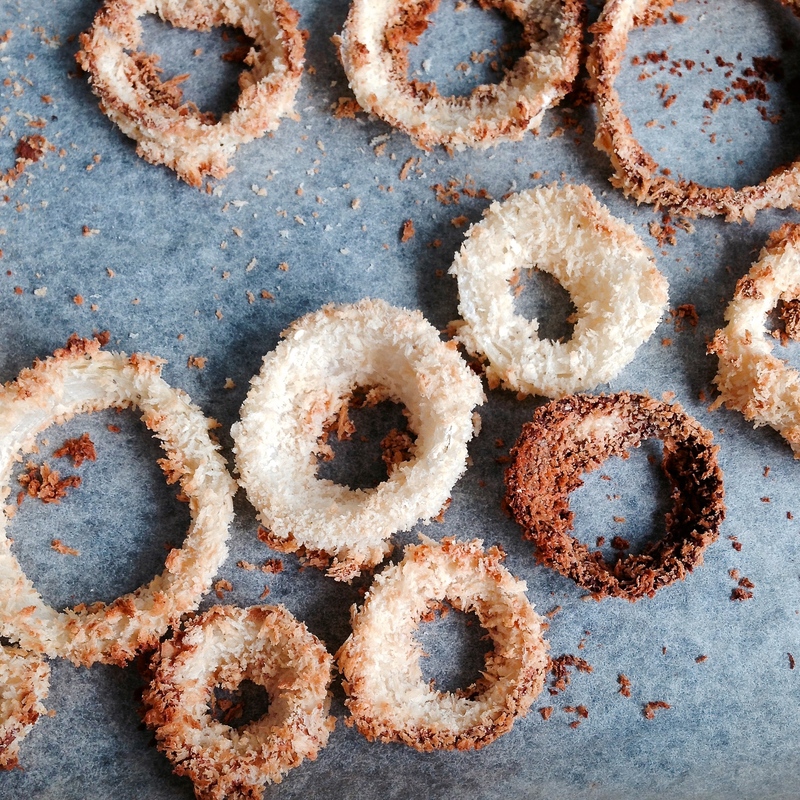 Toss onion rings in dusting mix, then batter, shaking off any excess before rolling in crumbs to coat. 7. Bake for 10 minutes until they are golden brown. 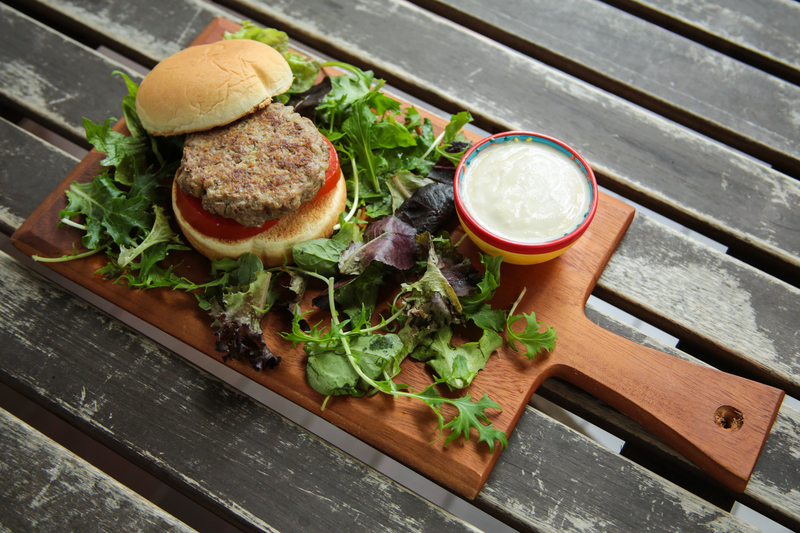 I remember watching Jamie’s 15 minute meals with my dad and we were bought drooling over these hamburgers that Jamie were making, comparing it to the boring meals my mom was preparing. Okay, I’m not being an ungrateful brat but we need a change of menu in the Koh house. So when my mother said she didn’t know what to cook for lunch today and that there was minced beef lying in the fridge, I knew I had to make the burgers. 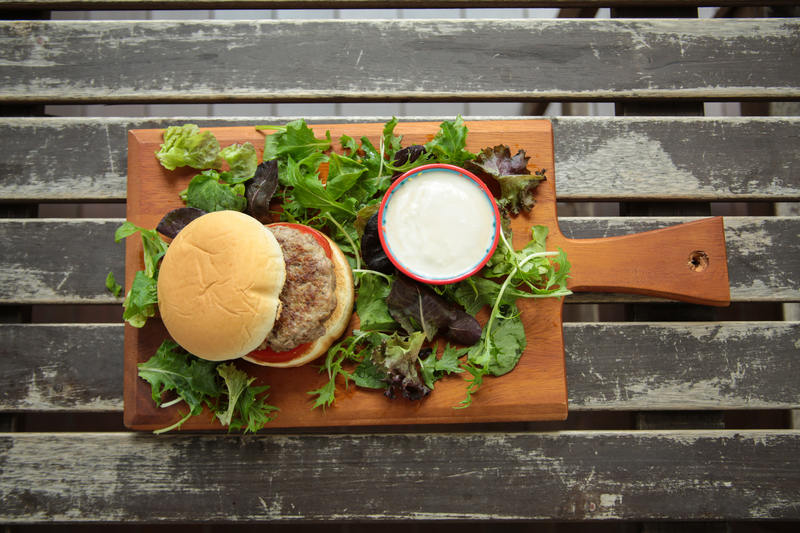 The sauce is so healthy anyway, it’s yogurt- something my mom loves, which means the burgers naturally receive a thumbs up from the mother. 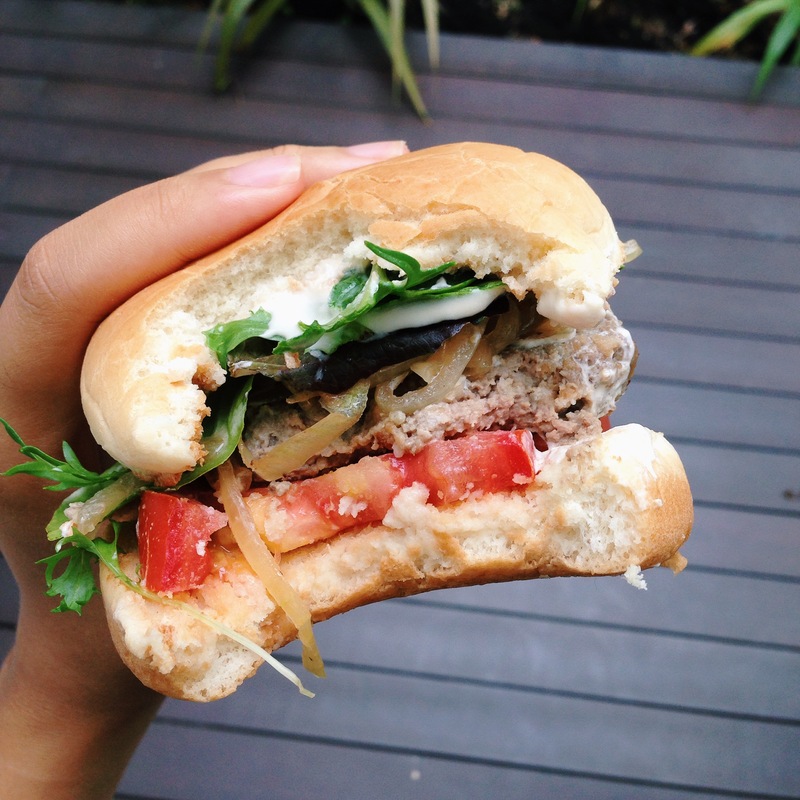 The best part of making your own burgers is that you can pile whatever you want onto your burger. I dumped some caramelised onions for the sweetness, sliced tomatoes for the juiciness and salad for the fibre and colour on top of my beef patty which was then topped with a dollop of yogurt rippled with worchesteire sauce.